North Carolina House passes Holocaust education bill. Action moves to Senate. BY T. KEUNG HUI, News and Observer, April 16, 2019. Click for full report. North Carolina lawmakers recalled their sobering memories of touring Nazi concentration camps before the state House unanimously voted Tuesday to require public school students to be taught about the Holocaust. House Bill 437 requires the State Board of Education to include instruction of the Holocaust and genocide into the English and social studies standards used in middle schools and high schools. 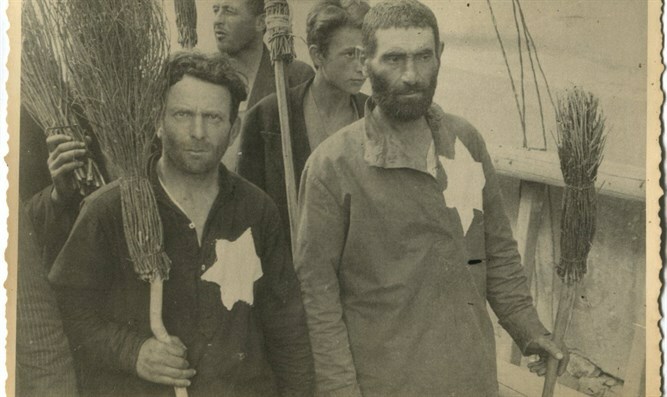 Supporters of the legislation say it’s needed because some people still deny that the Nazis killed millions of Jews, Roma and other people they considered to be undesirable. The “Gizella Abramson Holocaust Education Act” now goes to the state Senate. Abramson was a Polish-born Holocaust survivor who relocated to Raleigh and shared her experiences with students around the state before she died in 2011. The legislation has been heavily promoted by the Jewish community, including the N.C. Council on the Holocaust. Similar efforts are occurring in other states to require that schools teach about the Holocaust. Several legislators recalled visiting the Dachau concentration camp in Germany. “I saw the showers where people were gassed,” said Rep. Ted Davis, a New Hanover County Republican. “I saw the furnaces where people were burned. I will never forget that for the rest of my life. The bill received no opposition from lawmakers. But some legislators said Tuesday that students should also learn about what happened to African-American slaves and Native Americans. “I do have a part of our history that I just want to make sure we never forget and that’s the first genocide and that was the massacre of American Indians many years ago who were just standing for their rights to protect their land, protect their villages,” said Rep. Charles Graham, a Robeson County Democrat. Rep. Carla Cunningham, a Mecklenburg County Democrat, said she hopes the new class will include what happened to the slaves who were brought to America. REENA SIGMAN FRIEDMAN, PH.D. Dr. Friedman is Associate Professor of Modern Jewish History at the Reconstructionist Rabbinical College. She is also Adjunct Professor of Jewish History at Gratz College. SHARI HERMAN GLAUSER Ms. Glauser is a retired teacher, HAMEC educational speaker, and member of HAMEC’s 2G network. Seating is limited and is on a first come, first served basis. By Arutz Sheva staff, April 17, 2019. Click for full report. For the first time since the Warsaw ghetto was liquidated during World War II and all its residents were killed or deported to death camps, one hundred Diaspora Jewish families will celebrate a Passover seder in the ghetto, along with the Rabbi of the local Lubavitch Jewish community and his family. Rabbi Shalom Ber Stambler, Chief Rabbi of Chabad-Poland is hosting a special Passover seder in the heart of what was formerly the Warsaw ghetto with approximately one hundred Jewish families from Israel, Europe and the USA as his guests. Mr. Yosef Nachum and Nakmi’a Ben-Shem (previously Feldschuh) will be flying in from Israel to participate in the seder. Daughter Sharon Ben-Shem expresses, “Child prodigy Josima Feldschuh, the celebrated young pianist of the Warsaw Ghetto, was my aunt. She perished on April 21, 1943 shortly before her fourteenth birthday, while in hiding. Her very last meal took place the prior evening—the seder night of 1943! This year, we will be joining the seder in Poland together with her family—her brother (my father) and sister (my aunt) and I (her niece). We will be in Warsaw, in the seder night, in her city, precisely on the day that she passed away. Numbering among local guests are the members of the Spielman family, whose uncle Vlaidslav Spielman was a world-famous pianist. Albert Stankovski, director of the Warsaw Ghetto Museum which is currently being constructed by the Polish government, will also attend. “Before the War, approximately one-third of Warsaw was Jewish,” recounts Stankovski. “Commemorating pre-War Jewish Warsaw and celebrating the growth of the current Jewish community is of utmost importance to us. The Passover celebration organized by Rabbi Shalom Ber Stambler and Chabad Lubavitch is a vital part of this process. The at the Warsaw Ghetto Museum are likewise dedicated to this goal. We aim to preserve, for future generations, the memory of the Jews of Warsaw who were imprisoned behind the ghetto walls during the German occupation and subsequently murdered in the German camps.” The Warsaw Ghetto Museum will be housed in the historic building of the former Children’ Hospital established by Jewish families Bersohn and Bauman as a clinic for children of all faiths. The exhibition at 60 Sienna Street is due to open on the 80th anniversary of the outbreak of the Warsaw Ghetto Uprising. In 1991, Rabbi Shalom Stambler and his family were sent by the Lubavitcher Rebbe to Warsaw with the mission of revitalizing Jewish life in Poland. Since then, the Stamblers has invested enormous energies to cultivate Jewish life, culture and resources in a city where Judaism was largely wiped out during the war. The communal Passover seder is one of their latest effort to rejuvenate the community and spread awareness of Jewish identity and Jewish life in Poland. The seder will be divided into three groups and led in three different languages—Polish, Hebrew and English. Toward the end of the evening, they will merge and conclude the seder as one. 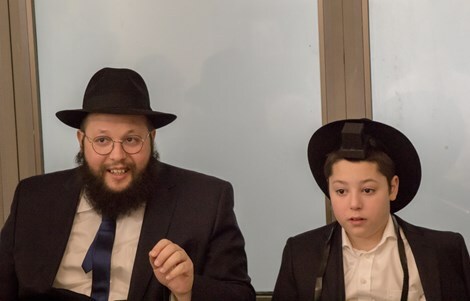 The star of the evening is, undoubtedly, Yossi Stambler, Rabbi Stambler’s 13 year old son, who will lead the seder in Hebrew, while his father leads a parallel seder in Polish. Despite his youth, the boy has earned a reputation as a talented orator. The English-language seder will be led by several young Lubavitch rabbis from the USA who are traveling to Poland specially to participate in the event. One of them, Rabbi Levi Goldschmidt, is a great-great grandson of Rabbi Tzvi Hersch Gur-Aryeh, a Jewish dignitary in Warsaw before the war. Gur-Aryeh was slaughtered in the ghetto massacre on Pesach. Holocaust historian Dr. Hillel Zaidman writes that on the eve of Passover 1943, Rabbi Gur-Aryeh and his family, along with other Lubavitch chassidim, covertly baked matzah at grave risk to their lives in order to be able to properly fulfill the commandments pertaining to the Jewish festival. The rabbi and his family perished together in the uprising. The lone survivor of the illustrious family was Chaya, a daughter who was married to Rabbi Nachum Goldschmidt and lived in Tel Aviv. Coming full circle, the Goldschmidt’s grandson, who lives in New York, will be returning to his ancestor’s native land where he will co-host the seder in English. Rita Ross , a Holocaust survivor and a member of HAMEC’s speakers bureau, will will tell the story of her family’s journey across Europe during the rise of the Nazi regime, fleeing her home in Austria to reach America. Or Hadash will unveil their new Holocaust memorial and music will be provided by the Or Hadash Choir. Date: Sunday, April 28, 2019, 1:00 p.m.
Join the Jewish Federation of Greater Philadelphia for candle lighting, music, readings and prayers at the 55th annual ceremony honoring those who were lost.